Scene shifting to the West coast. The remnant of "Jal" is now a low pressure, with 1002 mb and located at 15.3N and 75E, almost at Goa. This low pressure seems likely to re emerge into the Arabian Sea off the S.Konkan/Goa /N.Karnataka coast by tomorrow, 9th. Though it will be at around 1004 mb, not very deep, the UAC associated with with this System at Mid-Upper Level will precipitate rains. The rains will be concentrated in the Konkan/Goa and South Mah. regions initially on the 9th. the sea level low, move into the Saurashtra peninsula. 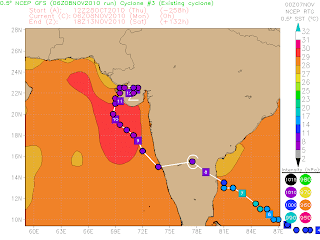 System should precipitate fairly heavy unseasonal rains in the Saurastra region and N.Gujarat around the 10/11th. Rainfall is expected to creep into S.Rajasthan and west M.P. A system expected to enter Andaman Sea around 13th. Vagaries will keep up dating as and when.